Growfood.com » Sustainable Family Garden – Heirloom Seed Pouch, Micros, and Instructions – Package Deal! Sustainable Family Garden – Heirloom Seed Pouch, Micros, and Instructions – Package Deal! 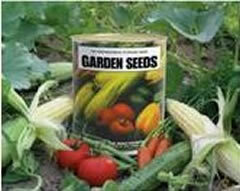 » Sustainable Family Garden - Heirloom Seed Pouch, Micros, and Instructions - Package Deal! Over 23,000 HEIRLOOM seeds! Twenty four of the best and most productive varieties for the home gardener - double sealed for maximum freshness and chosen to grow well in all parts of the USA. PLUS, 2 Packages of Mittleider Micro-Nutrients, the Mittleider Soil-Bed Gardening digital short course book and additional instructions. Not only can you now store and plant high quality non-hybrid open pollinated (heirloom) seeds year after year, you can also harvest your own seeds for future plantings! This is the best heirloom seed product we’ve found anywhere! A brand new and unique Storage Seed Pouch with over 23,000 seeds of 24 of the best Heirloom seeds to grow anywhere in the USA! The same quantity of seed from other sources would most likely cost you between $60 and $100. This double-sealed reclosable Perpetual Garden gives you more seeds for your money. AND, we are able to combine the multi-year heirloom seed package with 2 packages of the Mittleider Micro-Nutrients, and the Mittleider Soil-Bed Gardening digital book, plus additional illustrations and instructions to help assure your gardening success, ALL for less than you would pay for just the seeds if you were to purchase them separately!